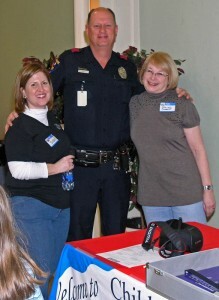 Adat Chaverim Sisterhood Program Chair Susan Schwartz (left), Officer Dawson of the Plano Police Department and Sharyn Diamond. Adat Chaverim Sisterhood of Plano will receive the bronze Or Ami “Light of my People” Award for excellence in programming from the Women of Reform Judaism this December at the 48th WRJ Assembly in Washington, D.C. The award was won for their January meeting, “Let’s Play It Safe” children’s safety program. 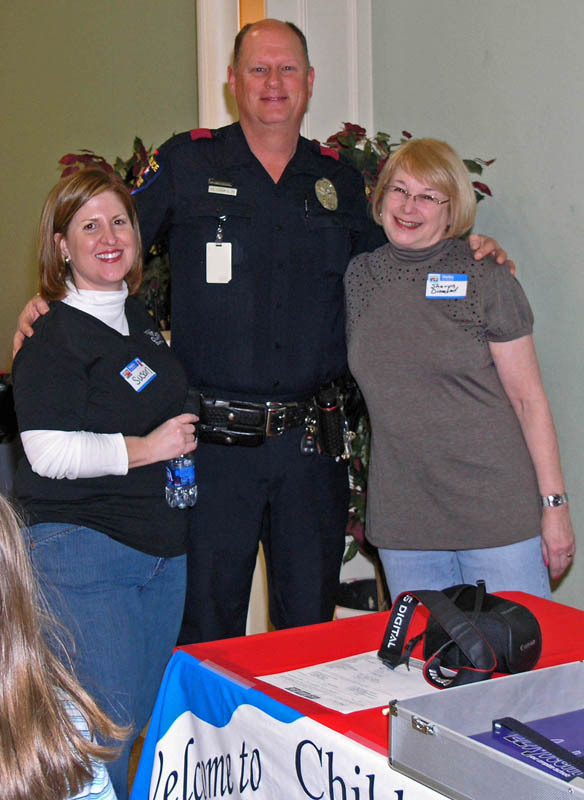 Participants in the program included the Plano Fire Department, Police Department, Adat Chaverim parents and children and Sharyn and Alan Diamond electronically fingerprinting and photographing the children for parent personal records. Natala Assa, Sisterhood president, said, “The award is given out every two years, and honors sisterhoods undertaking unusual and significant social justice programs, community service and educational projects.” Mazel tov to Adat Chaverim’s Sisterhood for winning this prestigious and noteworthy award! Applications are due July 25 for the Jewish Youth Tzedakah Foundation, one of several programs across the country that aims to introduce the concept of tzedakah, (the commandment to give), and all of its responsibilities to teens in 10th and 11th grade. Participants in this program serve on a board with 15-20 of their peers. The board learns about the foundations of tzedakah, various Jewish organizations and works together to decide how to allocate the funds that they have raised. This program gives teens great opportunities to work as part of a group, struggle with important concepts and develop an understanding of the non-profit world and the needs of the world around them. Their work will also include doing community service projects in and around Dallas. Participants will meet once a month, from September 2011 to May 2012 to explore the significance of Jewish philanthropy, actively engage in community serve and learn leadership and decision making skills. Teens will serve as part of a grant-making board to distribute $10,000 to the Jewish projects of their choice. Participants will make a $250 donation to the fund, which will then be supplemented by local donors. The donation can be made upfront, through sponsorships or be paid over several months. For more information, contact Gail Herson at gherson@jfgd.org or 972-740-6751. Max Grunewald, son of Fred and Jerri Grunewald, has been named one of 23 McDermott scholars for 2011. Max is a graduate of Ann and Nate Levine Academy, and the St. Marks School of Texas. An award-winning debater, Max was also a varsity wrestler who placed 4th individually at the state level and helped St. Mark’s to its 13th state title and 35th conference championship. A member of the school’s honor service organization, he volunteered with Jewish Family Service and the Dallas Food Bank, and was a founding member of the Jewish Youth Tzedakah Foundation. He spent last summer in UT Dallas’ George A. Jeffrey NanoExplorers Program; his resulting research on carbon nanotubes earned second place in the chemistry section of the ExxonMobil Texas Science and Engineering Fair. To prepare for a career in environmental engineering, he plans to major in engineering. This summer, he will be studying business and Chinese at Yunnan University in Kunming, China. Some 600 students applied for the program. Collectively, the 11 men and 12 women were in the top 1.4 percent of their high school classes and averaged a two-part SAT score of 1525. They are athletes, artists, scientists and writers. Ten of them are from the Dallas area, five are from other parts of Texas, and the remaining eight hail from seven other states. “This is a group of remarkable young people who will contribute greatly to the McDermott Program, the University and the greater community while further developing their potential as they take advantage of the opportunities we will help them to access,” Program Director Molly Seeligson said. As McDermott Scholars, the students will have educational expenses — including tuition and fees, and stipends for living expenses, books, travel and post-graduation preparation — covered for the next four years. They also will participate in a wide variety of cultural and educational enrichment experiences in the Dallas area and beyond. Freshman year includes an orientation trip, weekly leadership development seminars and a trip to Washington, D.C., for an immersion in national politics. During their sophomore year, scholars take leading roles on campus, and they experience state and local politics during a trip to the state’s capitol in Austin. Junior year is focused on study abroad and/or internships. Senior year centers on final preparations for the next phase of scholars’ lives and includes a class service project. When the 2011 class arrives on campus, more than a decade will have passed since UT Dallas welcomed the inaugural class of McDermott Scholars. The members of this year’s class will join the 55 Scholars already in attendance; these 78 Scholars will eventually join the 105 current alumni of the McDermott Program. Gail Herson of the Academy of Torah in Greater Dallas (ATID) was one of 24 Jewish educators from 16 different states and two Canadian provinces who gathered July 11-15, in suburban Boston for the Jewish Women’s Archive’s (JWA) summer Institute, The Power of Our Stories: Jews and the Civil Rights Movement. The program began with each person telling a two-minute story about an object and the Jewish woman connected to it. From their homes in places as far away as Whitefish, Montana and Winnipeg, Manitoba, participants brought rolling pins, jewelry, recipes, photographs, prayer books, and even in one case, an edible object — blintzes left over from that morning’s breakfast with a beloved grandmother — that evoked stories of Jewish women who were important in their lives. After sharing their personal stories, the participants began the more formal part of the Institute, a series of sessions designed to introduce JWA’s Living the Legacy social justice curriculum. Among the highlights were presentations by Dr. Debra Schulz, author of “Going South: Jewish Women in the Civil Rights Movement,” Rabbi Jill Jacobs, director of Rabbis for Human Rights and author of “There Shall Be No Needy: Pursuing Social Justice through Jewish Law and Tradition,” and an interview with Vicki Gabriner about her experiences as a civil rights worker in the South. The Jewish Women’s Archive Institute for Educators is made possible by a grant from the Dorot Foundation. The Jewish Women’s Archive was founded in 1995 to respond to the lack of information about and understanding of the contributions of Jewish women to American history. Since then, JWA has amassed the world’s most extensive online collection of material on American Jewish women, all of which can be accessed for free by anyone with an Internet connection.